In celebration of the 40th year of the Fukuda Doctrine, representatives from Japan and ASEAN gathered at the Manila Hotel on October 1, 2018 to witness the unveiling of the Doctrine’s Commemorative Marker spearheaded by The Philippines-Japan Society. After the unveiling, a symposium was also held at the Fiesta Pavilion where the Doctrine was first pronounced by the late Prime Minister Takeo Fukuda on August 18, 1977. Former Prime Minister Yasuo Fukuda, son of PM Takeo Fukuda, was present to personally lead the unveiling ceremony. He was accompanied by other special guests: Japanese Ambassador to the Philippines Koji Haneda, Executive Secretary Salvador C. Medialdea, Philippines-Japan Society President Francis C. Laurel, Acting Secretary of Foreign Affairs Jose Luis G. Montales, and Philippine Ambassador to Japan Jose C. Laurel V.
Speakers for the symposium that morning were Dr. Ginandjar Kartasasmita, Chairman of the Indonesia-Japan Friendship Association; Ambassador Delia D. Albert, former Secretary of Foreign Affairs of the Philippines; and Dr. Mie Oba, Professor of Tokyo University of Science. Dr. Kartasasmita presented a historical perspective on the Fukuda Doctrine while Amb. Albert talked about ASEAN-Japan-Philippines Relations, and Dr. Oba gave insights on the future relations between ASEAN and Japan. Japan will cooperate positively with ASEAN [the Association of Southeast Asian Nations] while aiming to foster a relationship based on mutual understanding with the countries of Indochina and will thus contribute to the building of peace and prosperity throughout Southeast Asia. The Fukuda Doctrine Commemorative Marker was designed at the instance of The Philippines-Japan Society by Filipino scholars of the Japanese Government studying at the University of the Philippines, Los Baños. The Philippines-Japan Society will co-host together with The Embassy of Japan in Manila a Symposium on the Fukuda Doctrine on October 1, 2018 at the Manila Hotel. The Symposium is envisioned to be a forum for reflecting the past, present, and future ASEAN-Japan partnership and the contribution of the Fukuda Doctrine thereto. 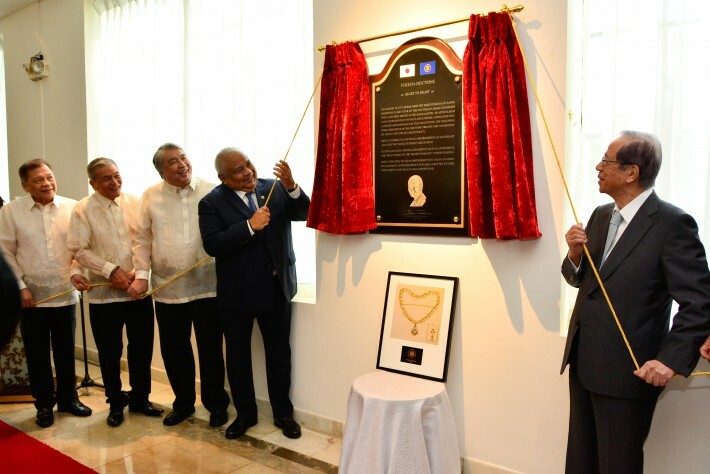 Also highlighting the event is the installation of a commemorative marker in the Manila Hotel, where the Fukuda Doctrine was first pronounced by then Prime Minister of Japan, Takeo Fukuda, in August 18, 1977. The doctrine serves as a guiding principle of Japan’s foreign policy towards the ASEAN and has positively impacted ASEAN-Japan relations in the past four decades. Last year, PJS met with PM Fukuda’s son, Yasuo, himself a former Prime Minister of Japan, on the significance of the doctrine. The Symposium will feature prominent speakers who will share thoughts and insights into the foundations, the current state and the future prospects of ASEAN-Japan relations through the prism of the Fukuda Doctrine. The 40th Philippines-Japan Friendship Celebration Awards Night was held on July 30, 2018 at New World Hotel in Makati City where Mr. Tomas I. Alcantara, Chairman and President of Alsons Consolidated Resources Inc., was conferred the 40th Philippines-Japan Society Medal of Merit. The Alsons Group was founded in the mid-1950s by Mr. Alcantara’s father, a pioneering businessman who had a vision of tapping the rich natural resources of Mindanao. 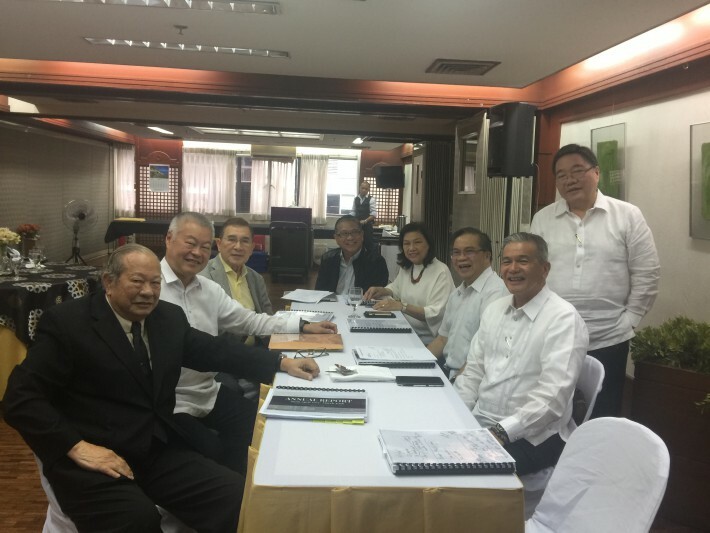 The group has since grown into a diversified conglomerate that is heavily invested in energy, power generation, property development, agribusiness, aquaculture, information technology and allied industries – mostly operating in Mindanao. The group has been and continues to be a reliable and durable business partner of many major Japanese corporations. A prominent business leader in his own right, Mr. Alcantara has also served in the Government as Undersecretary of Trade & Industry from 1986 to 1995 where he headed the Industry and Investments Group and was Managing Head of the Board of Investments. In 1996, Mr. Alcantara was designated Ambassador – Special Envoy of the President of the Republic of the Philippines for the Asia-Pacific Economic Cooperation (APEC) which the Philippines hosted in 1996. He currently serves as the Chairman of the APEC Business Advisory Council (ABAC) Philippines, having been appointed as member last December 2016 and elected January 2017. 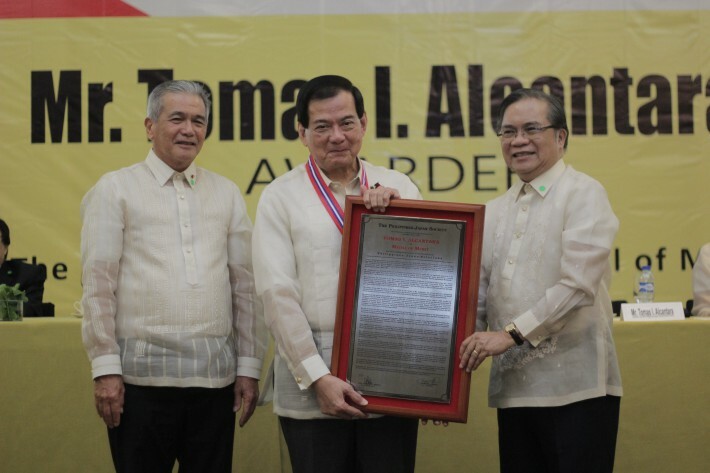 Read the full Citation of the Medal of Merit presented to Mr. Alcantara here. Read the full Acceptance Speech of Mr. Alcantara here. PJS President Francis C. Laurel, gave the opening remarks for the evening. Ambassador Makoto Katsura, President of The Philippine Society of Japan, and H.E. Koji Haneda, Ambassador Extraordinary & Plenipotentiary of Japan to the Philippines also spoke at the event. Musical numbers were rendered by “Harmonya: The String Ensemble of the University of the Philippines Los Baños, The Philippines-Japan Ladies Chorale, and the UPTUGMA Koto Ensemble from the University of the Philippines Diliman. ¹The Philippines-Japan Medal of Merit is conferred annually to Filipino or Japanese nationals who have distinguished themselves in the promotion of friendship, trust, understanding, goodwill, mutual respect and shared benefits. See list of Medal of Merit awardees. The Philippines-Japan Society, Inc. held its Annual General Membership meeting on July 17, 2018 at the Amb. Jose S. Laurel Hall, 3rd Flr Dominion Building , 833 A. Arnaiz Avenue, Makati City. Headed by PJS President Francis C. Laurel, the members had several items on this year’s agenda including the Annual Report of the President, Financial Report of the Treasurer and the election of the members of the PJS Board of Trustees for 2018-2019. To read more about the major events and activities of PJS last year, view the PJS Annual Report 2017-2018. Other matters discussed included the program for the 40th Philippines-Japan Friendship Dinner & Awards Night to be held on July 30, 2018 at the New World Hotel, with Mr. Tomas I. Alcantara as the 40th recipient of the Philippines-Japan Society Medal of Merit. At the meeting’s adjournment, President Laurel thanked the members and reiterated the important role the Society plays in maintaining good relations between the Philippines and Japan. PJS held its 40th Philippines-Japan Friendship Golf Tournament last February 18, 2018 at The Country Club, Santa Rosa Laguna with the new Ambassador of Japan to the Philippines, H.E. Ambassador Koji Haneda, as this year’s honored guest. Ambassador Haneda took the Ceremonial Tee Shot at exactly 6:10 a.m., which officially opened the tournament. 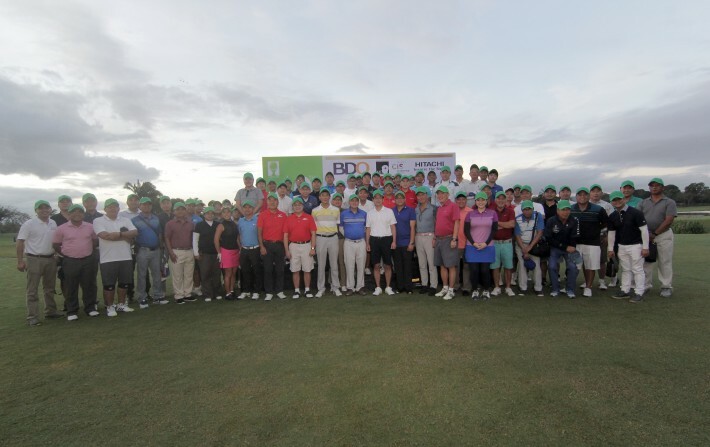 After the tee off, the Tournament Group Photo was taken and the different teams headed to their respective holes to start the game. Similar to previous years, this year’s tournament was also a Scramble (Best Ball) honesty game format made up of four-man teams where each team played alone with no one checking Team scores. This year’s Champion was the team of Edwin Umali, Komoda Takahisa, Eddie Jose, and Fumihiko Harada with a gross score of 67, less the team handicap 5 for a net score of 62. The team of Koyama Yuji, Okubo Atsushi, Feliciano Torres, and SP Sumulong took the 1st Runner Up trophies with their gross score at 73, less their team handicap of 10 for a net score of 63. Finally, the team of Joey Coronel, Alex Cabrera, Arthur Chung, and Hiromi Shimoda finished the game as 2nd Runner Up winners with their gross score of 67, less the team handicap 3 for a net score of 64. All the members of the winning teams will have their names etched on their trophies, which will be displayed at the PJS head office in Makati. At its 40th year, The Philippines-Japan Friendship Golf Tournament continues to be a much-awaited annual tradition aimed at fostering friendship and cooperation between Filipinos and Japanese. Players were allowed to form their own teams with at least one Filipino or one Japanese member and a maximum of four players. Mr. Joseph “Jun” Uy, Jr., heads the tournament as Chairman and Mr. Raymond M. Abaquin, as co-Chairman.